Hmmmmm, Where should we begin? For what has seemed like months, the Brett Favre saga is finally drawing to end. If you find yourself asking why Favre isn't on Tampa Bay, here's why. 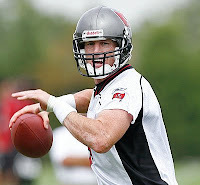 The Bucs current roster includes not 3, but 5 quarterbacks. So what your saying is 38-year old Brett Favre is an overwhelming better option than Jeff Garcia? Garcia is the same age as Brett (38) and over the past two seasons in nine fewer starts, Garcia has been the better quarterback. Since his final six regular season starts in Philadelphia (where he led them deep into the playoffs) and over his 13 starts with Tampa Bay in 2007, Garcia has a quarterback rating 11 percentage points higher than Favres, has averaged 13 less interceptions and nearly 12 fewer TD's, albeit in nine fewer starts. Garcia is less prone to the untimely interception, a circus-like ending to a season, and has only one fewer playoff win than Favre over the past ten seasons. Gruden may love to stockpile QB's, but they weren't giving up a potential first rounder for a 2-year lease, especially when Jeff Garcia isn't a bad option. While were on it, I swear this will be the last you hear from me. Packers GM Ted Thompson, and head coach Mike McCarthy have a long tough road ahead of them. While Aaron Rodgers will have to be the guy to follow a legend, due to the events of the last couple months Thompson and McCarthy will be the guys credited for pushing that legend directly out the door. McCarthy and Thompson willingly drew a line in the sand and never wavered, they made their decision and refused to allow public outcry and outside opinion affect their own. If next season results in anything less than an appearance in the Conference Championship or even better, the Super Bowl, that decision they stood by will be endlessly scrutinized. The legacies of Thompson as a general manager and McCarthy as a head football coach will be directly defined by the success of the Packers, post-Favre. I have to give credit where credit is due on this one, I admire the stance, and wish you all the luck. After the Cowboys visit Lambeau on September 21st that is. HaHaHaHaHaHaHaHaHaHa, Tell me someone else saw those American cyclists wearing masks to cover their nose and mouth upon arrival in Beijing for the 2008 Summer Olympics? These cyclists were on the cusp of Keeping It Real, that is until today, when they promptly apologized for insulting the Chinese and the Olympic Games organizing committees. Is it just me or is the IOC (International Olympic Committee) the new version of the La Cosa Nostra? The members of the U.S. men's basketball team, primarily Lebron James, were prepared to make statements to the press about topics like pollution, Darfur, and Tibet. Just weeks later, as documented on ESPN's Outside The Lines, the globally conscious superstar no longer thinks that these games should be a pedestal for politics, in short, he's in China to win a gold medal. I've heard of back peddling, but there is something entirely different going on here. The U.S. Olympic Committee has issued apologies to the Chinese and IOC for the actions of a few U.S. cyclists, oh yea, and those same cyclists issued written apologies (while men with black hoods on stood next to them). The U.S. Olympic Committee also mentioned that they never handed out those masks, nope those were given by out by another national governing body, riiiiiiiiiiiiight. 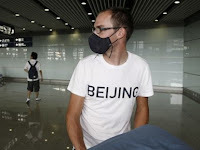 I'm not saying that wearing a mask is entirely necessary, even though the air quality in Beijing is as good as the air quality in a West Virginia coal mine, I'm just saying it was kind of funny to see those guys get off the planes in t-shirts that read were in BEIJING, wearing Darth Vader masks. Keep It Real, no one on the plane trip over thought, wait maybe were going to get some trouble for this? Once the IOC got wind, the apologies came flowing in. About King James, if you think Lebron James is going to be playing in Greece for Olympiakos come 2010, I've got a bridge in Brooklyn I'd like to sell you. What Lebron's people said was "If Lebron were offered $50 million a season, he'd seriously consider the jump to Europe." Really? So Lebron would skip becoming the highest paid player in the best league in the world (the NBA), in the best market in the world (New York), to play for a championship that no state side person has ever heard of for $50 million dollars a season? $50 Million is a HUGE amount of money, that's more than "A-Rod Dollars," but is it enough to lure Lebron from the United States? In short, NO F'N WAY. The United States barely cared about Yao, Dirk, and Manu, until they played in the league with that Jerry West logo. Our kids don't won't pull on Nikes sporting a Lebron logo if he is dunking over 5'8 Europeans. Gatorade doesn't shell out millions of dollars to athletes that you never see play. Lebron probably banks $100 million a year in U.S. endorsements alone. Jordan became known worldwide while playing in Chicago, not L.A., not New York, CHICAGO! Before you get all worried David Stern, remember, IT WON'T HAPPEN! Lebron is way too image conscious to jilt the United States, the NBA, and his millions of fans stateside. More importantly however, with Lebron there is way too much money to be made in one of the richest countries in the world, the United States. Lebron did a great job hosting the 2007 ESPY awards, its proved he is one of the top two most dominant male athletes on the planet, he can sell NIKE's from Boston to Beijing, and he doesn't have to be playing in Athens to do so. Olympiakos can have all the 6th men on NBA teams they want, we'll keep Lebron. A little "homerism" coming right down the pipe here: Jason Bay, not Manny, but not all that bad. While Bay isn't putting the earth shattering numbers up that Manny is in Los Angeles, he's eased Boston fans into transition very well. The Canadian born outfielder has hit safely in each of his six games for the Sox. 11 for 26 at the plate, 6 RBI's, and slugging .692, not bad for a guy replacing a future Hall of Famer. A 3-game set against Oakland and a 3-game set against Kansas City will do that for a guy, so will batting behind David Ortiz, reigning World Series MVP, Mike Lowell, and All-Star game MVP, J.D. Drew. Just as the American League contenders thought that Boston was dealt a major blow by being forced to move Ramirez to the West Coast, they've added an all-star in Bay and are on the cusp of adding veteran hitter Brian Giles to bolster their bench. Gone are the days that Boston was the cute underdog story, they are on the tails of the first place Rays, (still feels weird saying so) and safely holding off the Bronx bombers. KEEP IT REAL, they'll be there in October. The book is still out on whether or not the New York Jets actually will compete for a wild card spot in the AFC, but today they got better. Broadway Brett gives the Jets a better chance to win than Howdie Doodie (Chad Pennington) but then again any new QB might have improved their chances. From coveted rookie linebacker, Vernon Gholston to All-World 11 year veteran Alan Faneca, and now the legendary Brett Favre, is there anything out there that the Jets want they haven't gone out and got? I never want to see any franchise out of the tri-state area win much more than a box of crayolas, but FINALLY there is a team in AFC East that could give the Pats a little trouble, maybe even just get lucky and win one. Since "The Tuna" rebuilding project is more than two years away and the Buffalo Bills have decided to play games north of the border, were left cheering for the Jets, hey last time we rooted for a team from New York to knock off the Patriots it worked out pretty well. KEEP IT REAL! Pats have competition. Hope you enjoyed the first KEEP IT REAL Friday since I went on vacation, tell your friends, family, and people on the street, Friday, YOU KEEP IT REAL!